Ultrax aims to develop ultrasound scanning technology into a useful and effective tool for child speech therapy. On average two children in every British classroom (6.5%) suffer from Speech Sound Disorders (SSDs), making it difficult for them to communicate with their peers and integrate with society. Current therapy approaches rely heavily upon listening skills, which unfortunately may be impaired in individuals with SSDs. Instead, therapy based on visual feedback may benefit people for whom visual skills are stronger than auditory skills, and is potentially most useful for speech sounds that hard to describe or see externally. By actually showing the child how their tongue should be positioned, the need to describe it using complex language is avoided. The aim of the Ultrax project is to meet this need. 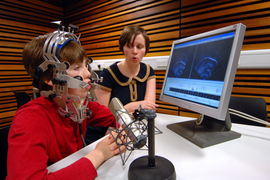 In collaboration with researchers at Queen Margaret University and Articulate Instruments Ltd, and funded by EPSRC's Healthcare Partnerships programme, we are developing currently available Ultrasound technology into a viable and effective tool for giving visual feedback of what is happening inside a user's mouth as they talk, with particular emphasis on child speech therapy. More information is available on the Ultrax project website.